And, climate control is not just for food. The first impression that climate-controlled warehousing gives is that it is specific to storing perishable items like vegetables, staples, grains, etc. While perishable goods form the majority, non-perishable goods also need climate-controlled warehousing to ensure their long-life. This includes furniture, raw materials, paper products, metals, wine, and liquor, etc. The choice of warehousing for each of these products will vary depending on their age, intended time of use, seasonal trends, inventory process like Last-In-First-Out or First-In-Last-Out and so on. All of your inventory needs to be protected from climate fluctuations to remain in good, usable condition. Even if merchandise does not fall under the perishable category, many items that are exposed to heat, moisture and humidity can easily turn into spoiled inventory. Whether it is for a short-term period of few hours before delivery or few months before the season kicks in, climate-controlled warehousing can preserve your inventory and save you money in the long term. Here are some for making climate-controlled warehousing work for you. While temperature controlled utilities control only the indoor temperature, climate-controlled warehouses control both temperature and humidity. It is critical that both of these climatic conditions are optimized at a relative measure to keep inventory in good condition. Whether it is the scorching heat of the Western states or the biting cold of Alaska, the indoor temperature and humidity of the warehouse must be maintained at optimum levels. Why? When outdoor temperature levels increase, so does humidity and vice-versa, which might be unfavorable for many products, especially agricultural produce and perishable goods. Too much humidity can spoil temperature-sensitive goods like medicines which require cold storage conditions, often in sub-zero temperature without humidity. Climate-controlled warehouses come with dehumidifiers that maintain temperature and humidity levels at optimum levels. Dehumidifiers also help you keep mold, dust mites, mildew, etc. from growing on your goods. Now that your climate control is dependent on the choice of a dehumidifier, you need to choose the one best suited to your purpose. There are two types of dehumidifiers – mechanical and desiccant dehumidifiers. Desiccant dehumidifiers use drying chemical substances like silica gel to absorb moisture from the air. They help keep the temperature within the warehouse at a constant level, but with reduced moisture levels. They are ideal for goods that have a long shelf life and need to be stored in constant temperature settings for a long period of time. Mechanical dehumidifiers, on the other hand, are meant to manage extreme conditions – the cold storage of a pharma plant, milk factory, raw meat processing shop, etc. They are powerful enough to absorb any amount of moisture and humidity from within the warehouse and keep the temperature levels at a constant rate. The difference between desiccant and mechanical dehumidifiers is the way they work. Desiccant dehumidifiers use dry chemical substances while mechanical dehumidifiers use refrigerated coils cooled using a motor fan. Picking the right dehumidifier will go a long way in keeping your inventory in good condition. Experts say that different types of goods require varying levels of humidity. For instance, in the United States where self-storage services are common, materials like photo albums, pianos made of fine wood, leather jackets, etc. are known to stick together, or worse, melt when humidity levels soar high. 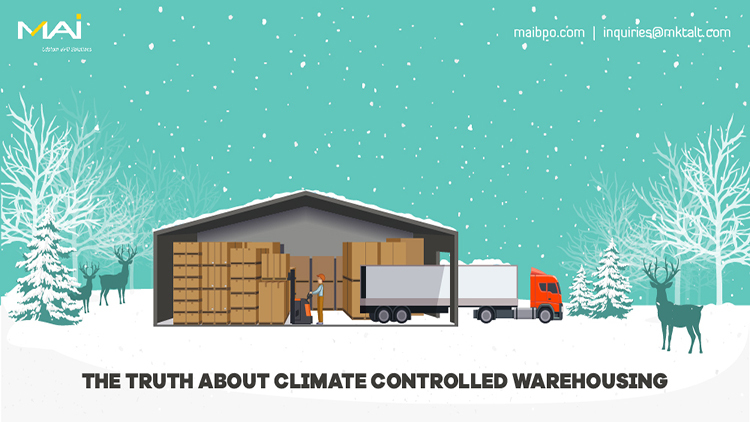 While you want to ensure that the temperature and climate levels are set at fixed levels, you also want to ensure that the warehouse owner sticks to it. Don’t enter into oral agreements with regard to the temperature. Do mention the temperature level and humidity levels in writing. Also, see to it that checks are set up to ensure compliance. There is one more benefit to putting everything in writing. The tenant cannot go for a legal writ based on oral agreements. Any damage claimed based on agreements that are not in written form cannot be considered. So, if you are the tenant or you are the warehouse owner, ensure that you put the climate specifications into writing explicitly. Be it on a truck or in a large warehouse, your goods need to be protected from heat and moisture at all times. A climate-controlled warehouse is the best option if you have large quantities of goods that need to be protected for a long span of time.